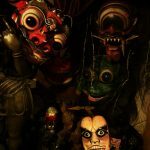 So you’re interested in visiting Hamburg? Good call! Hamburg is definitely one of the coolest cities in Germany. This city truly offers something for everyone, and I put together this travel guide to help you make the most out of your time here. 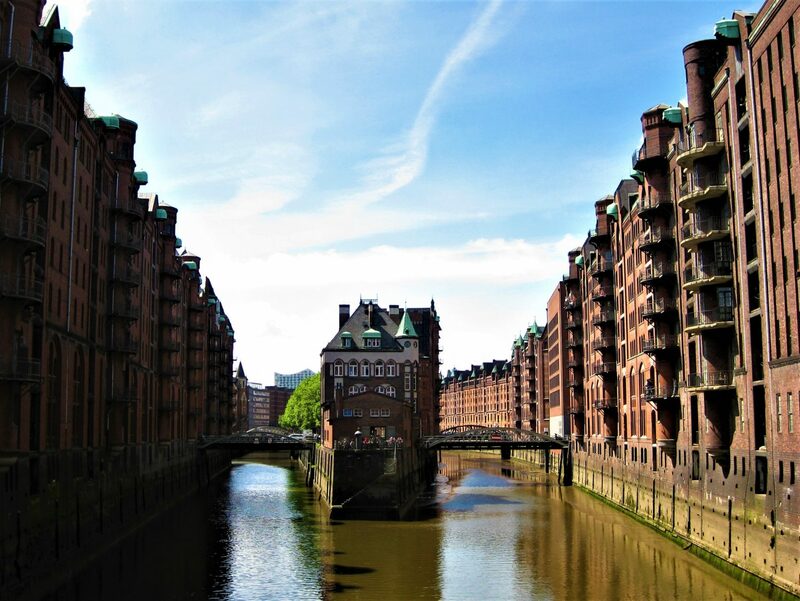 Now, before you read on, be advised that this is no typical travel guide; I purposely left out all the tourist traps and commercial attractions and included sights that I only got to know after moving to Hamburg and exploring the city. Hamburg really is a city that has it all, and this guide will let you know what’s good in town. Viel Spaß! 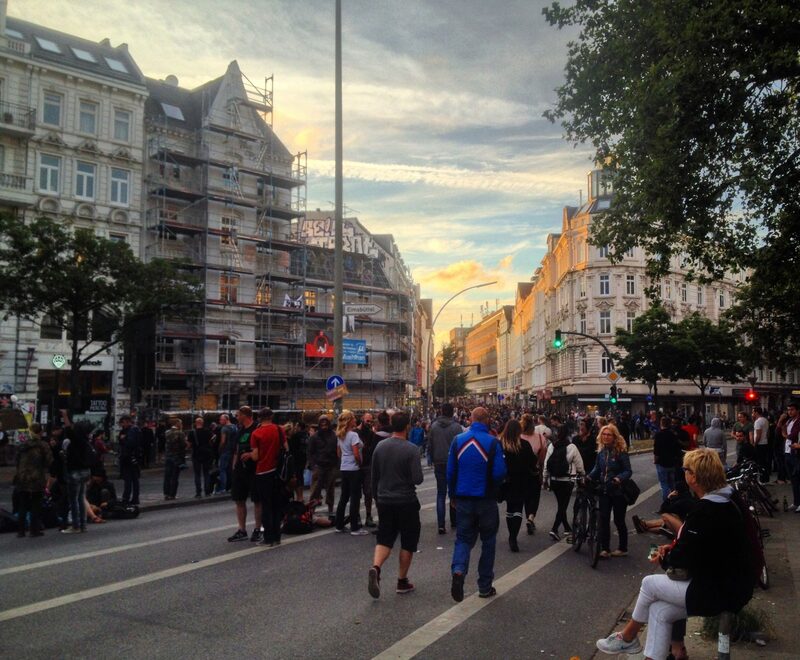 It seems that everybody is coming to Hamburg nowadays, but what makes Hamburg so cool? 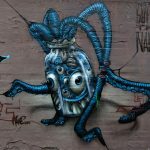 Why its alternative scene, its happening neighborhoods, and its Northern German, almost Scandinavian character among other things. Hamburg owes its unique character to a combination of factors and thus offers something for everybody, whether you’re looking for the alternative, the relaxed, the rowdy, or even the lascivious. Add to that a joie de vivre, or rather Lebenslust, like nowhere else in Germany (not even in Berlin) and a rich-yet-tragic history and you got yourself a unique city that’ll keep you entertained and interested for the length of your stay—whether that’s a weekend, a week, or a year (or many). 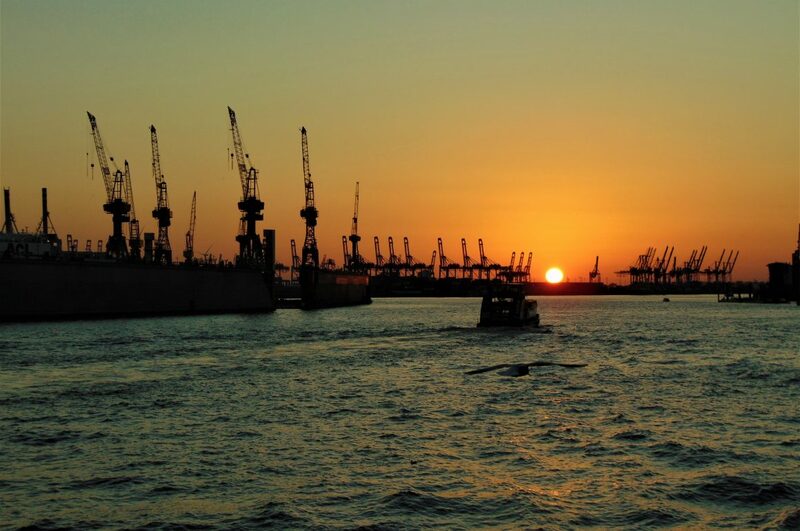 Hamburg has a very distinct feel from other German cities—even other Hanseatic ports. That’s because Hamburg, as opposed to other German port cities, made the transition into a modern trading and shipping center. Hamburg is home to one of Europe’s main ports and is often referred to as the Tor zur Welt, or “Gate to the World.” Unfortunately, Hamburg’s increasing importance in the 20th century also came with a price, and the city suffered heavily from the punishing area bombardment of the Western Allies during World War Two. 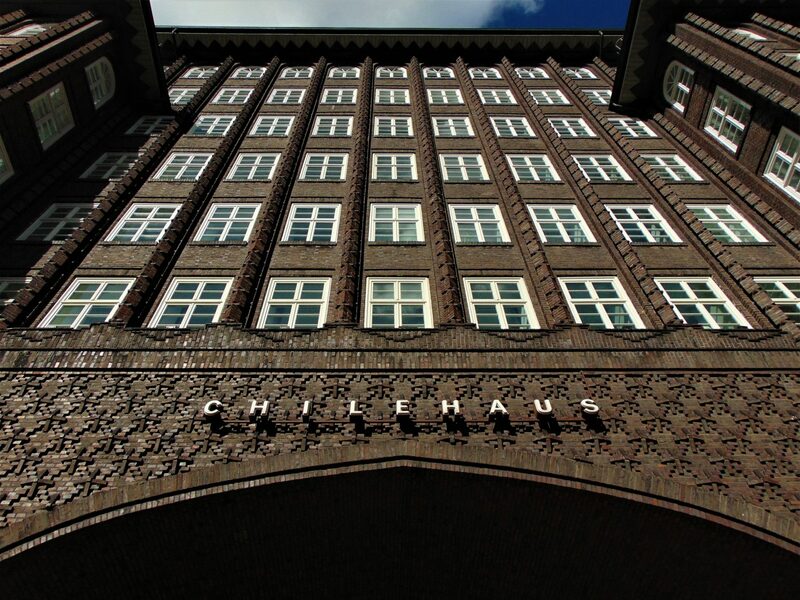 While a huge area of the city was destroyed during the war, there are still many areas and buildings that preserve Hamburg’s old charm—be they thin, crooked Hanseatic merchant houses or impressive Brick Expressionist office towers from the 1920s. But it’s not just about that; it’s also about the colorful squats, the hole-in-the-wall bars, the occasional impromptu street parties, and the live concerts. 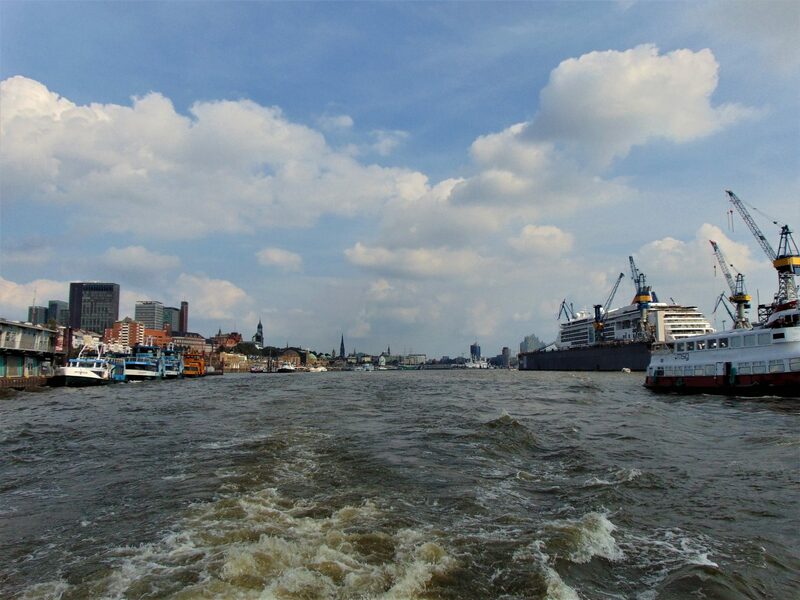 The rise of Hamburg is owed to its location on the Elbe river, not far from the North Sea. 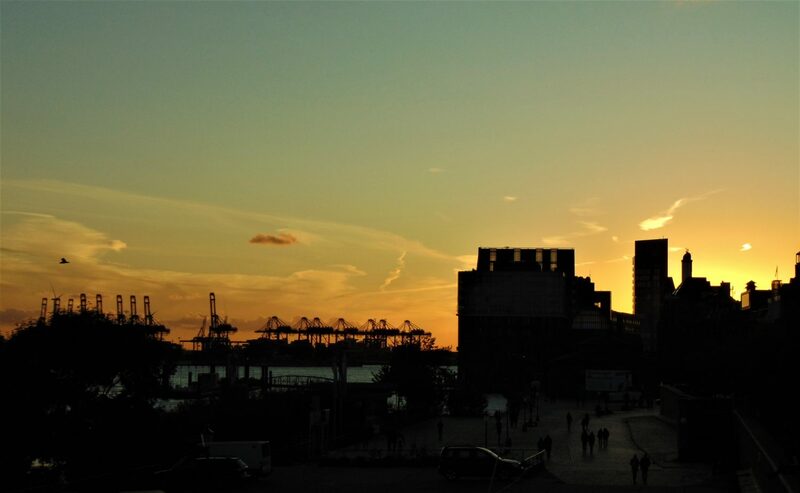 Already in the late twelfth century, Hamburg was designated a Free Imperial City by the German Emperor Frederick Barbarossa, meaning it could administer itself as a city-state within the Empire. Hamburg was a city-state for most of its history, and today constitutes one of Germany’s sixteen federal states. Hamburg was also one of the most important members of the Hanseatic League, a very powerful commercial alliance of cities all along the North and Baltic sea coasts, but also reaching deep into mainland Europe. The Hanseatic League built a huge commercial network extending from Cologne to Riga, from Krakow to Stockholm, and from Hamburg to Gdansk, Kaliningrad, and further to Tallinn. The city of Hamburg is proud of this legacy and even makes reference to it in its name: Freie und Hansestadt Hamburg (Free and Hanseatic City of Hamburg). Hamburg’s modern city limits include the district of Altona. However, Altona was an independent city until 1937 and, perhaps more interestingly, it was a Danish city from 1640 until 1864. 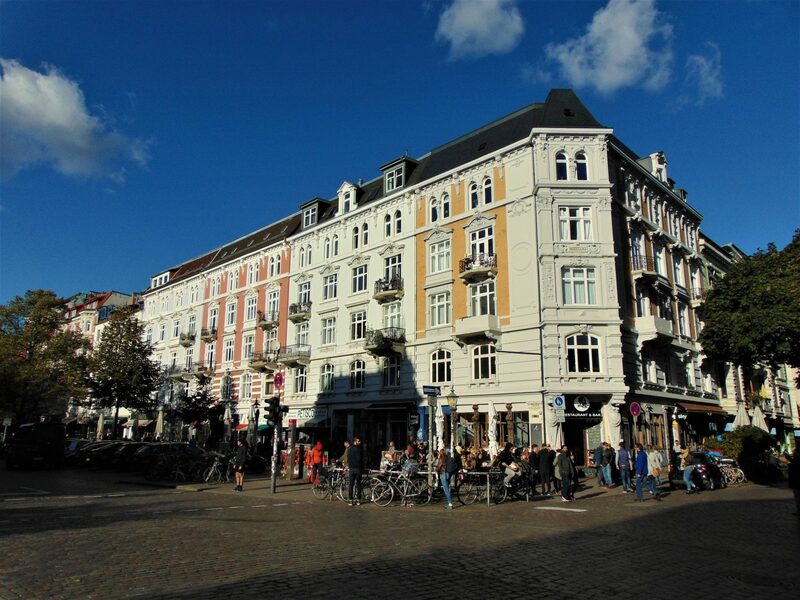 One of the most popular areas of Hamburg, the Schanzenviertel, is in Altona. Today, you can still see sand stones embedded into the sidewalk bearing a simple “A | H.” Those stones are the old border markings not only between the cities of Altona and Hamburg but between the German Confederation and the Kingdom of Denmark. 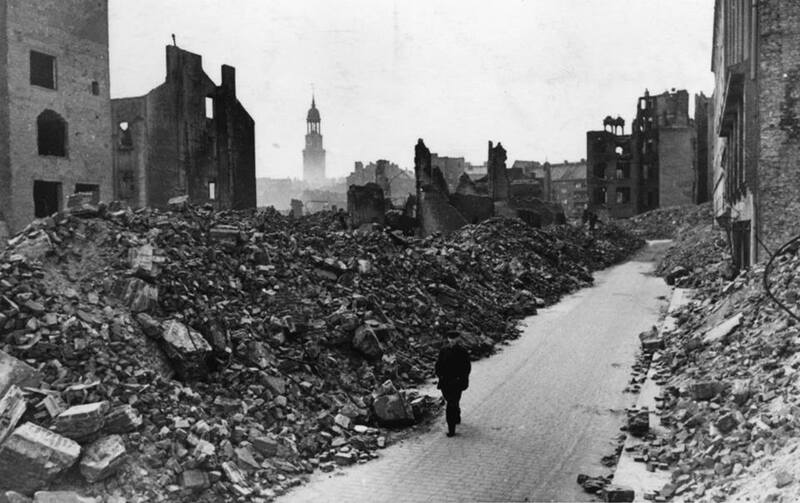 Hamburg was one of the cities hardest hit by Allied bombs during World War Two. In July 1943, the city was targeted in the largest aerial bombardment operation up until that time—code-named Operation Gomorrah. 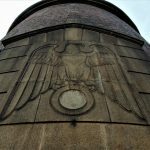 The destruction and reconstruction of Hamburg is something that plays a major role in the identity of the city, and you will inevitably witness the effects of it in the city’s architecture and remembrance. 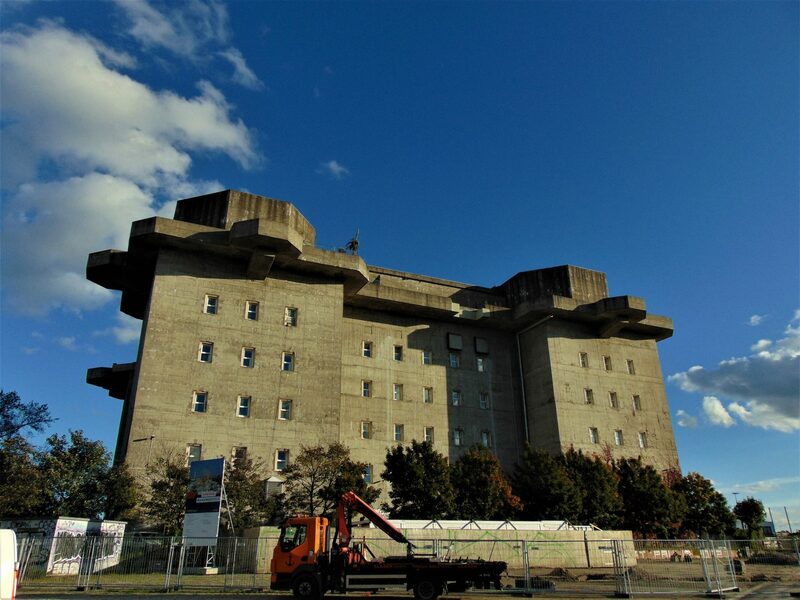 As a side note, due to the city’s importance and vulnerability, approximately 700 bunkers where built during World War II in Hamburg—that is, more than in any other German city during that terrible period. The St. Pauli piers (Landungsbrücken) are a landmark of the city. This area is unfortunately almost always full of tourists, but it’s worth checking out because of the Elbtunnel—a massive tunnel that runs below the Elbe river. 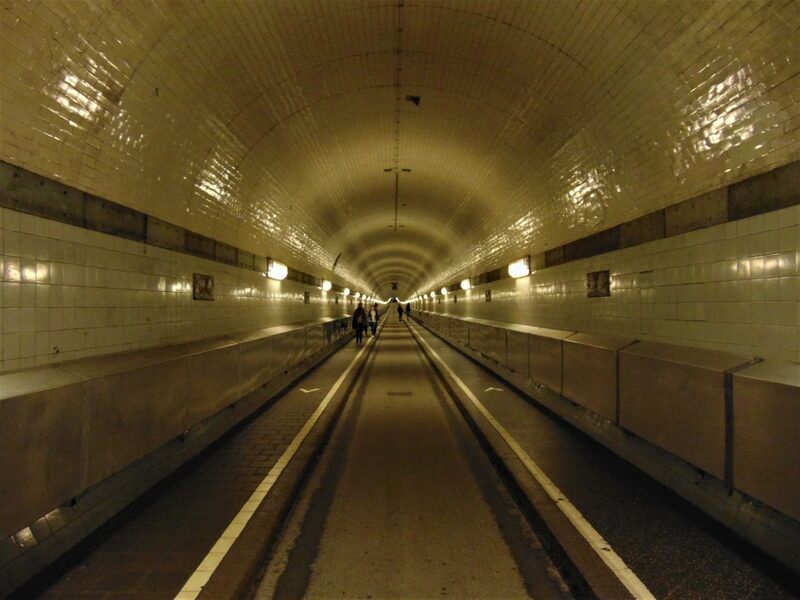 The Elbe tunnel was opened in 1911, is 24 meters below the surface of the river, and has a length of 426 meters. 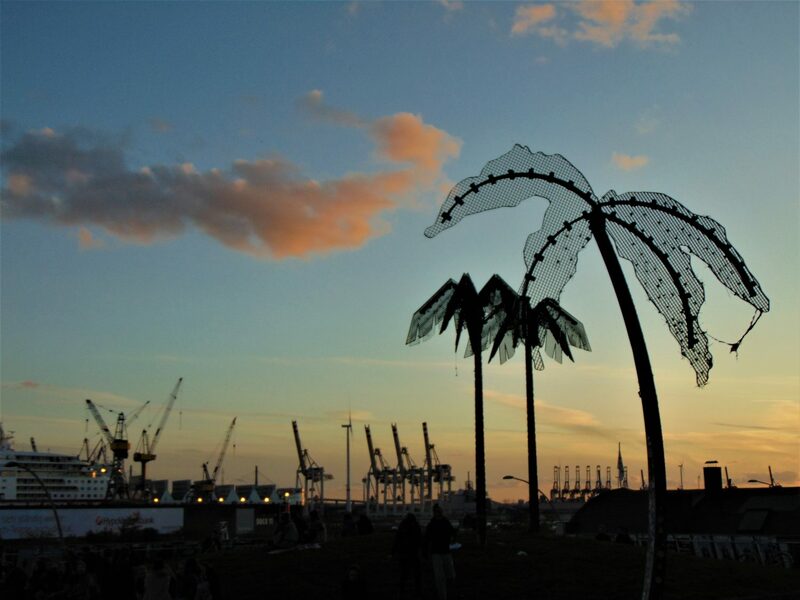 If you walk to the piers from St. Pauli make sure to check out the Bismarck monument on your way there. A bombastic monument dedicated to Chancellor Otto von Bismarck, this impressive statue embodies the nationalist kitsch of the early 20th century. 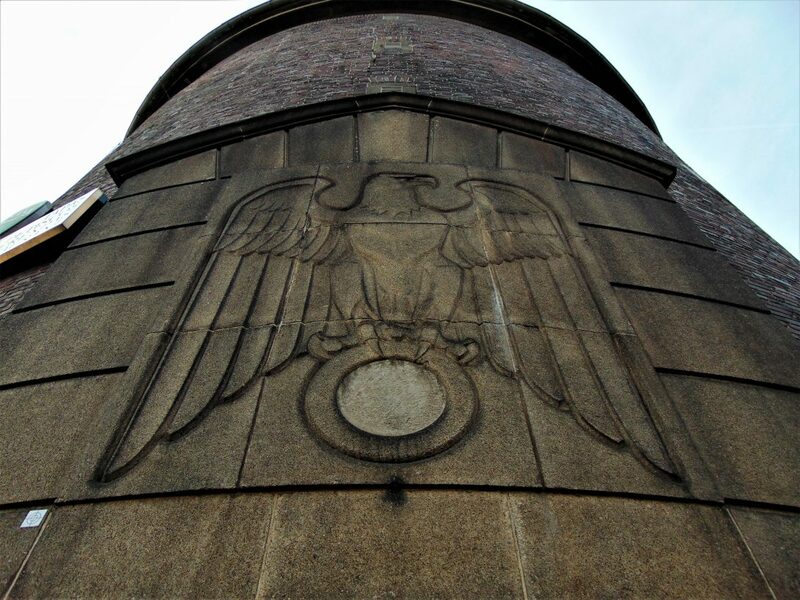 The base of the monument is fortified with concrete and functioned as an air raid bunker during World War II. A very cool thing to do while you’re there is to take the ferry line #62 over to Neumühlen. 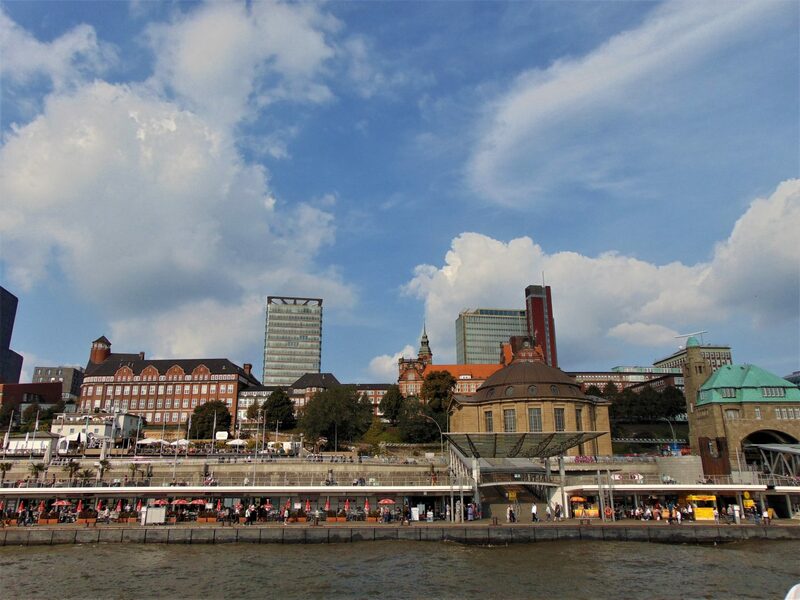 The ferry stops at Landungsbrücke 3 and takes you to the Elbstrand, a beach on the Elbe river just a few stops away. It’s seriously totally worth it, particularly since you’re traveling with the city’s public transportation and not some overpriced ferry for tourists. Your day-ticket (which I would advise you to get regardless) is also valid on the ferry. 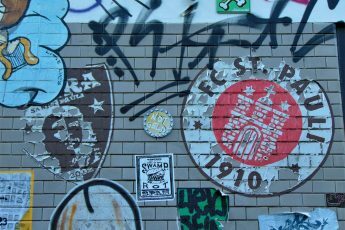 One of the things you cannot NOT do when in Hamburg is go to a game of FC St. Pauli. The team, nicknamed the Kiezkickers in reference to the part of town where they play, enjoys cult status in Germany and indeed the world. 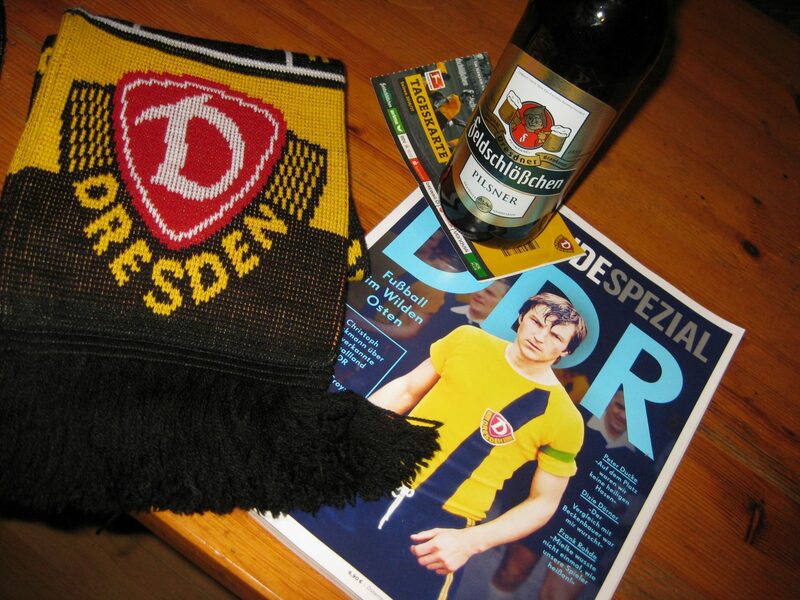 With chapters of supporters’ clubs in many countries outside of Germany and Europe, this second-division football club enjoys a support that surpasses its league. 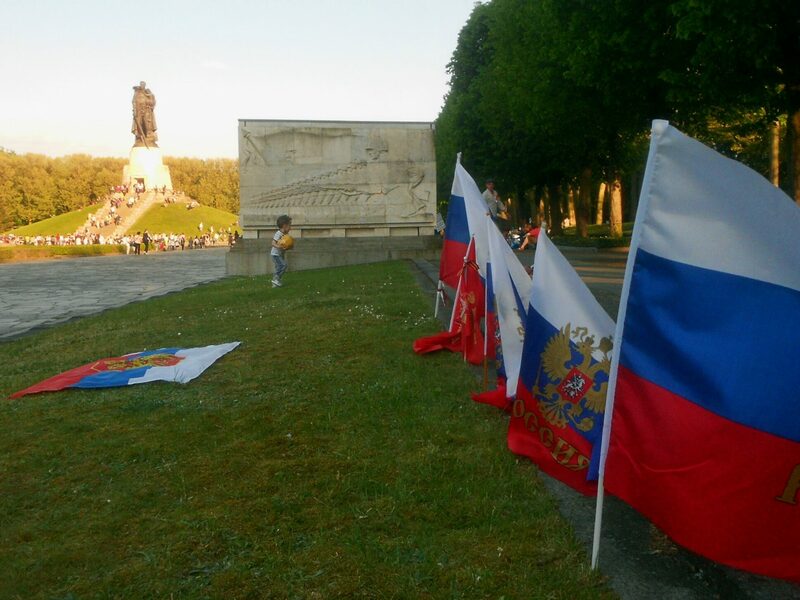 The team’s left-leaning supporters are a welcoming bunch, and you will usually encounter many foreigners at the team’s matches. 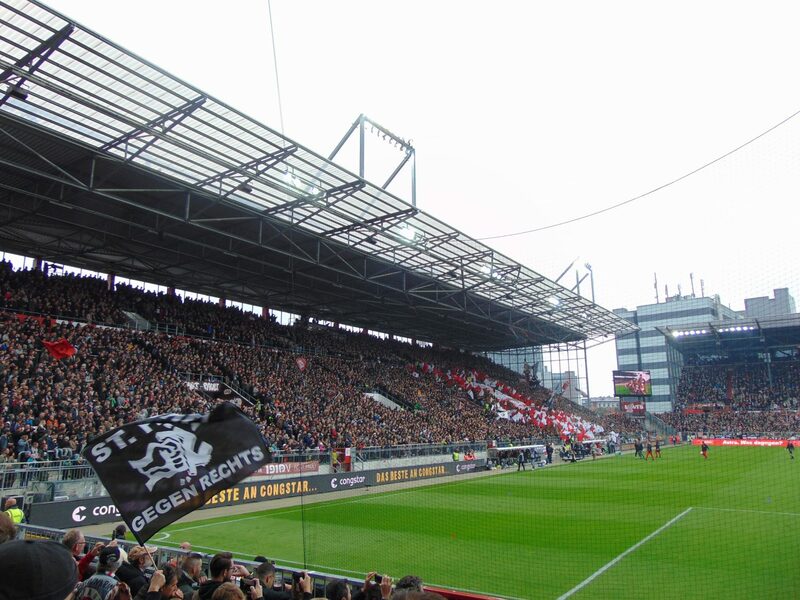 Buy your tickets in advance, enjoy the atmosphere at the Millerntor stadium, and stick around to pound back a few beers with some fellow football fans at the official St. Pauli supporters’ club house. Also, if you’re more keen on a smaller club visit a match of Altonaer FC 1893. Discovering St. Pauli can be kind of tricky. I remember I actually rather disliked it the first time I went there because I was just overwhelmed by all the tourist traps on the Reeperbahn. However, St. Pauli is now one of my favorite parts of town. 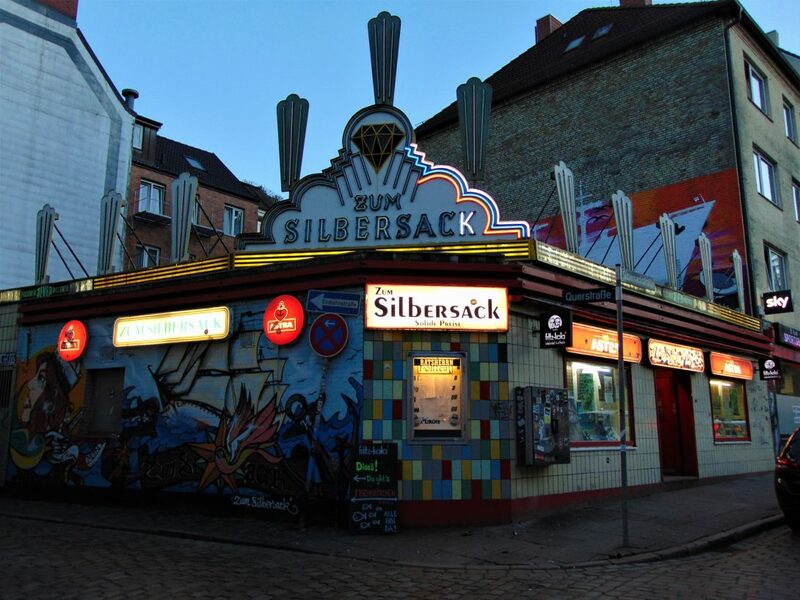 The area of St. Pauli that you want to check out if you want to go for a drink is the Hamburger Berg. One of my favorite bars there is Lunacy, and I can also recommend zum Silbersack just down the street. Other good bars include Drei Zimmer Wohnung and Wilde Hilde. 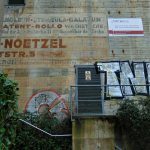 To get a good feel for the neighborhood check out the areas around Wohlwillstrasse and Simon-von-Utrecht Strasse. 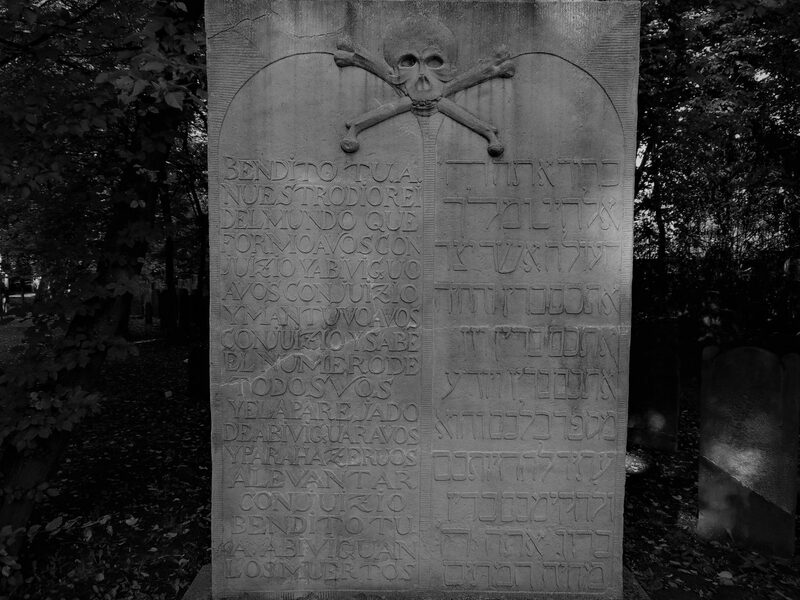 St. Pauli is nicknamed Kiez, or hood. 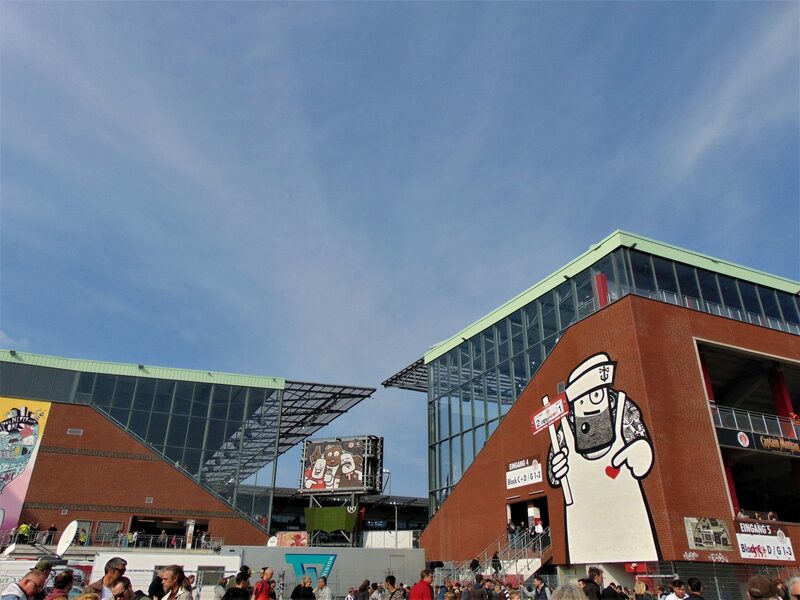 Visiting sailors turned St. Pauli into a huge entertainment district, and little has changed over the years. 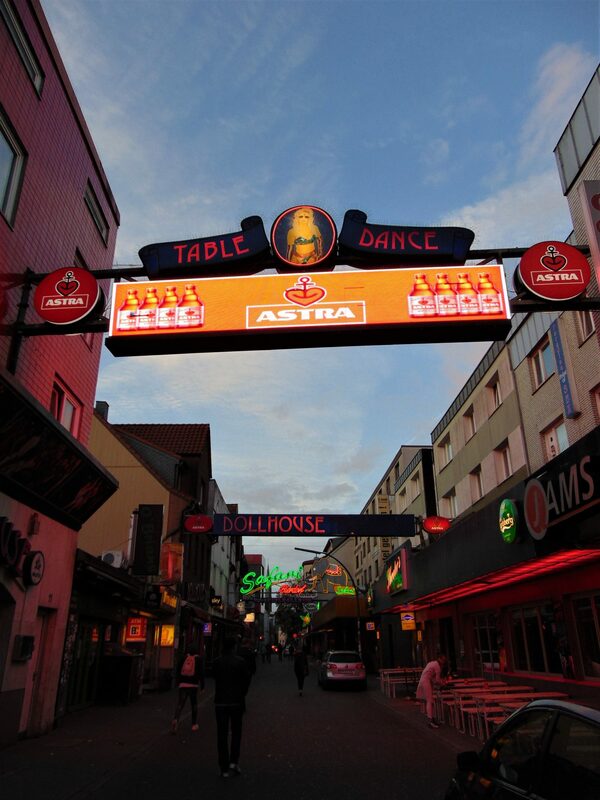 The Reeperbahn (Low German for Ropewalk) is also known as “Germany’s most sinful mile” and is, together with the Grosse Freiheit, the core of Hamburg’s Red Light district. This area is full of bars and establishments of all kinds and is usually crawling with tourists, which is why most locals usually avoid it. While I don’t ever go out on that street due to the rowdy crowds and overpriced, tacky establishments, it’s definitely worth walking through it as it’s a quintessential part of Hamburg. Also, the street has an interesting history: Grosse Freiheit is named after the religious freedom granted by the king of Denmark to the residents of Altona. After the Reformation, Hamburg became a strictly Protestant city with no freedom of religion. 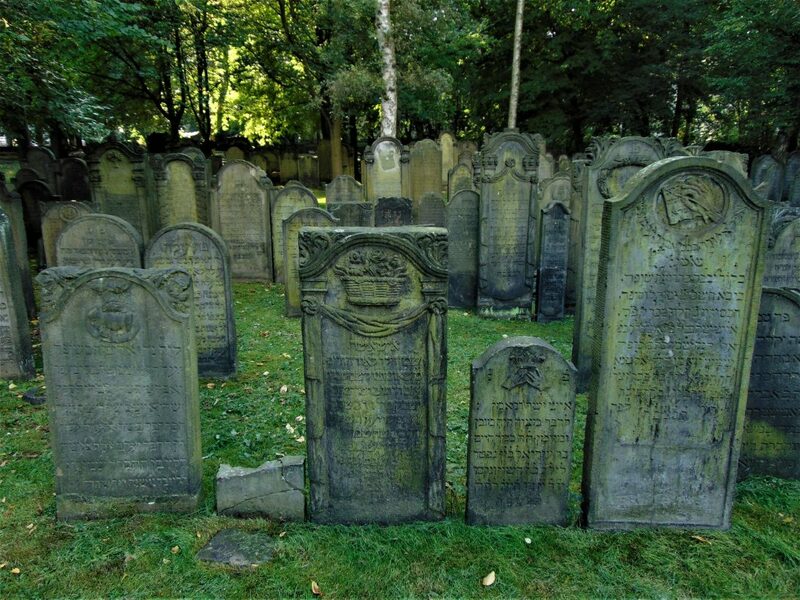 The kingdom of Denmark, which the city of Altona was part of, was much more tolerant, and thus scores of Mennonites, Catholics, and Jews made Altona their new home—which is also why you will find a Catholic church at the beginning of the street and an old Jewish cemetery close-by. The Grosse Freiheit is home to the Catholic church of St. Josef. This church is interesting because it hides a little treat in its basement for all of you interested in dark tourism: A few years ago, a crypt containing the remains of roughly 350 people was found underneath the church. 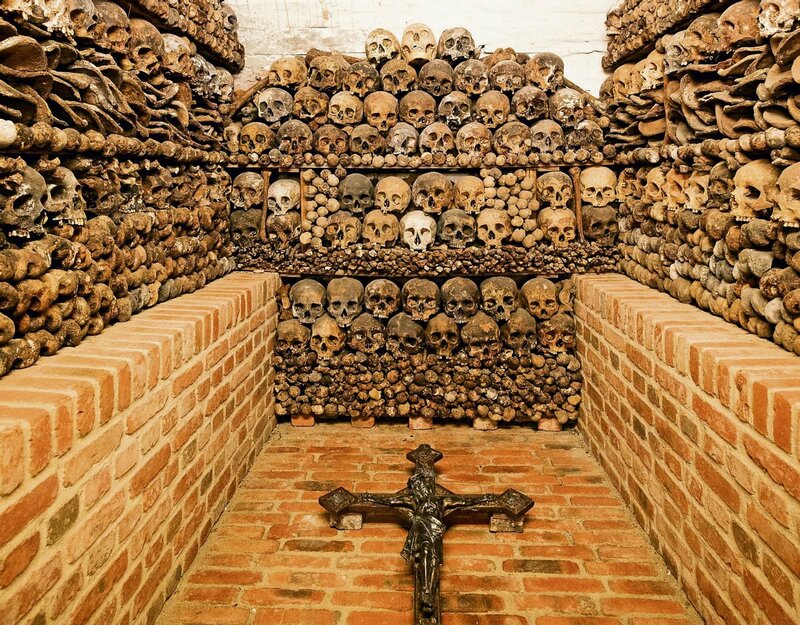 The crypt is only open to the public from 12:15 to 1 pm on Wednesdays, but you should go see it if you have the chance, as the ossuary at St. Josef’s church is the only one of its kind in Northern Europe (sadly though, taking pictures is not allowed). A popular spot near the Reeperbahn is Park Fiction. On a sunny day, you’ll find the park bustling with people hanging out, listening to music, and even grilling. The park sits atop a building and offers a pretty nice view of the harbor and the industrial docks, especially at night. Park Fiction is easily recognizable by the plastic palm trees that adorn it in an futile attempt to give Hamburg a “tropical” feel. Down the street from Park Fiction is a row of squatted houses. That’s the famous Hafenstrasse. If those houses weren’t squatted they’d be some of the most coveted pieces of real estate in the city. 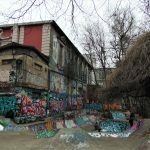 These waterfront squatted houses also are also home to a few cultural centers and pretty good bars. If you’re into the more alternative watering holes I’d advise you to check this place out. Hamburg is a very compact city, and the happening parts of town are adjacent to each other. I’m talking about St. Pauli, Sternschanze, and Karolinenviertel. The best starting point to explore all of them is the station Feldstrasse (Subway U3/Yellow line). Sternschanze, usually shortened to Schanze, is my favorite part of town. 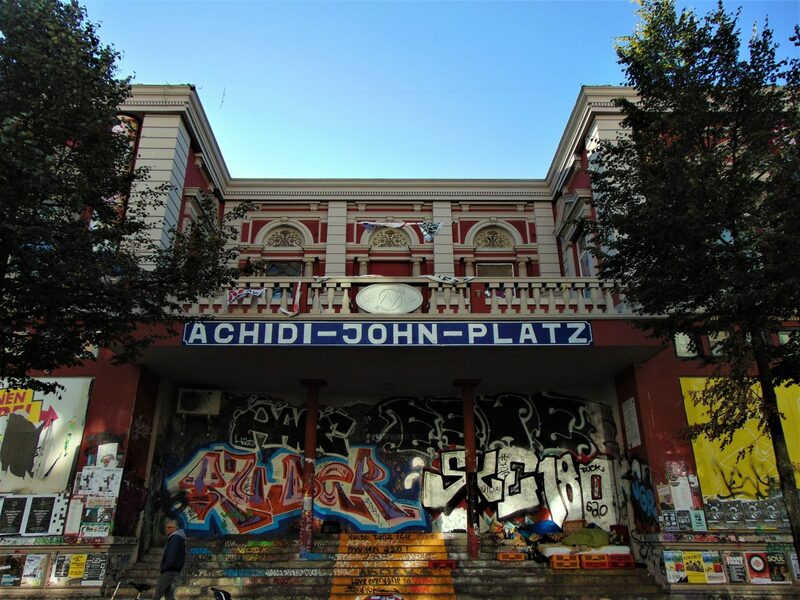 Despite the rampant gentrification of the area, the Schanze is still alternative and bohemian. 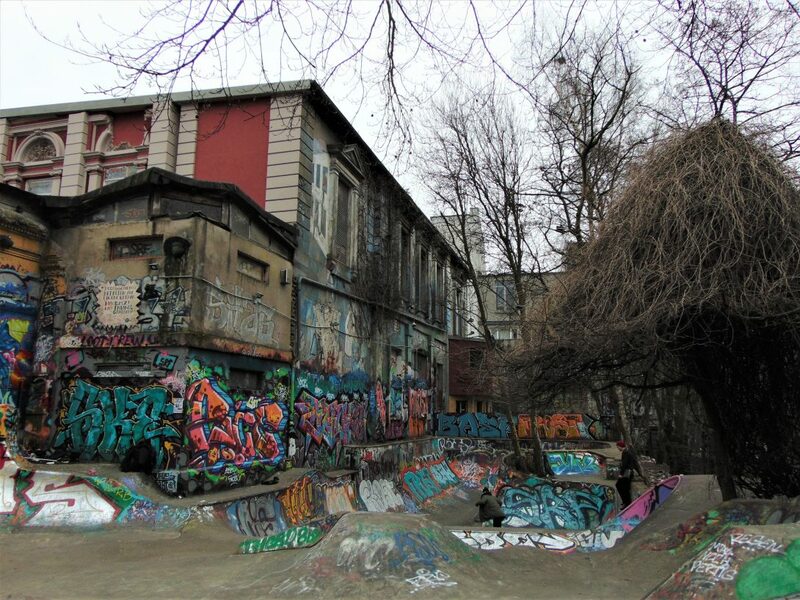 The area has a punk attitude to it, no less due to the presence of the Rote Flora, Germany’s most notorious squat. Behind the squat is a park with a skate bowl and a climbing wall built on the side of a bunker. 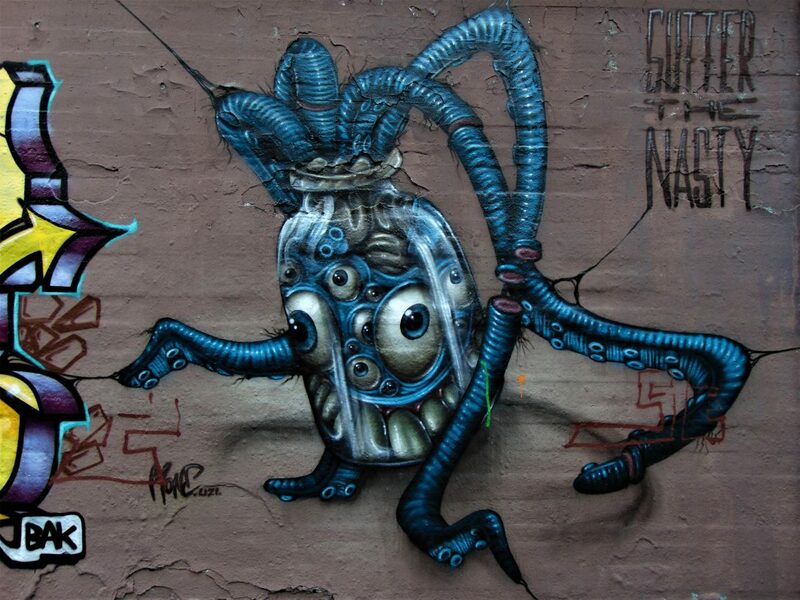 This area is known for its street art as well, so don’t forget your camera. The Schulterblatt is the main street and beating heart of the Schanze and also the coolest neighborhood in Germany, period. 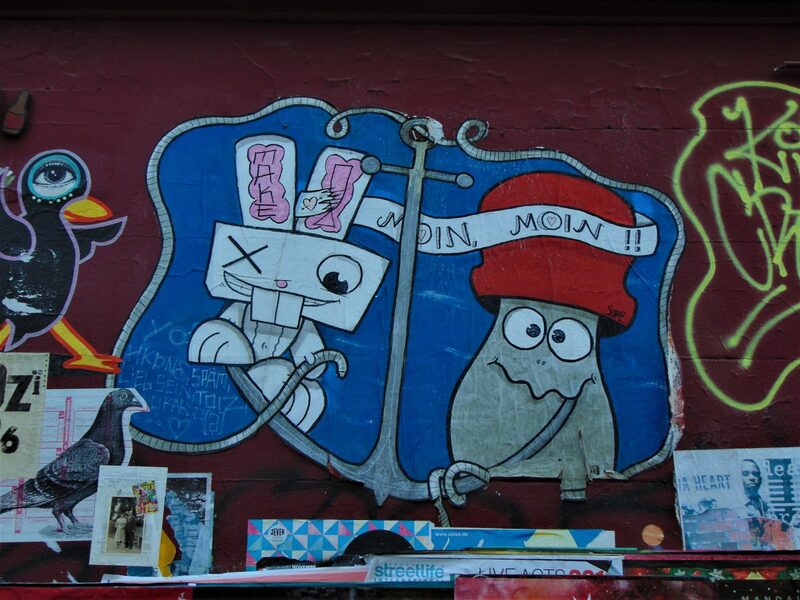 There’s nothing better than the Schanze, not even in Berlin. Sternschanze and St. Pauli meet at Neuer Pferdemarkt, the choice area in Hamburg to do a bit of Cornern. In summer, the area will be full of young people hanging out either at the park or the street corner in front of convenience stores, which here are called Späti (from Spätkauf, meaning “late night shopping”). Anyway, the difference between loitering here and in other German cities is that in Hamburg drinking a beer sitting on the sidewalk is totally in. You won’t see homeless people among the crowd but rather the hip and alternative types. An evening at that particular crossing beats a night out at a bar any day of the week. Give it a try! 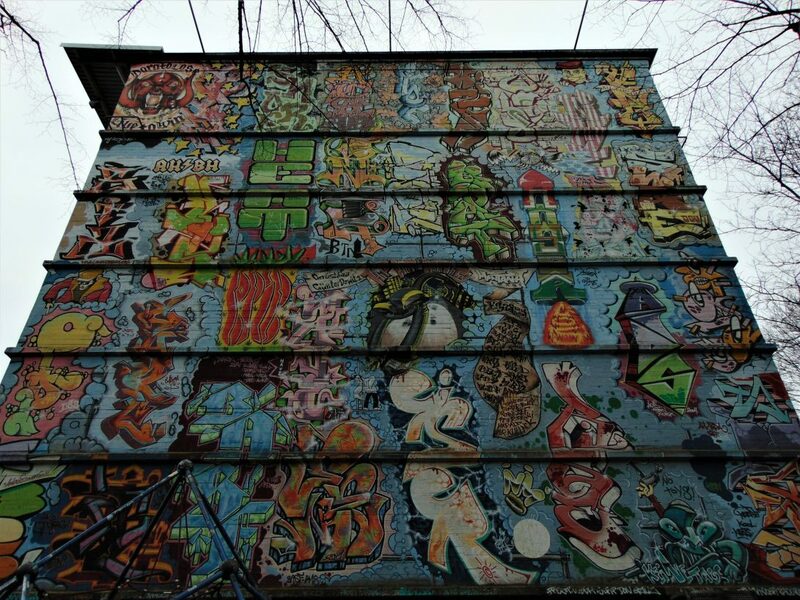 Not far from the Schanze is the Karolinenviertel. Centered around the Marktstraße, this neighborhood is like the Schanze minus the tourists, so it feels a bit more authentic. 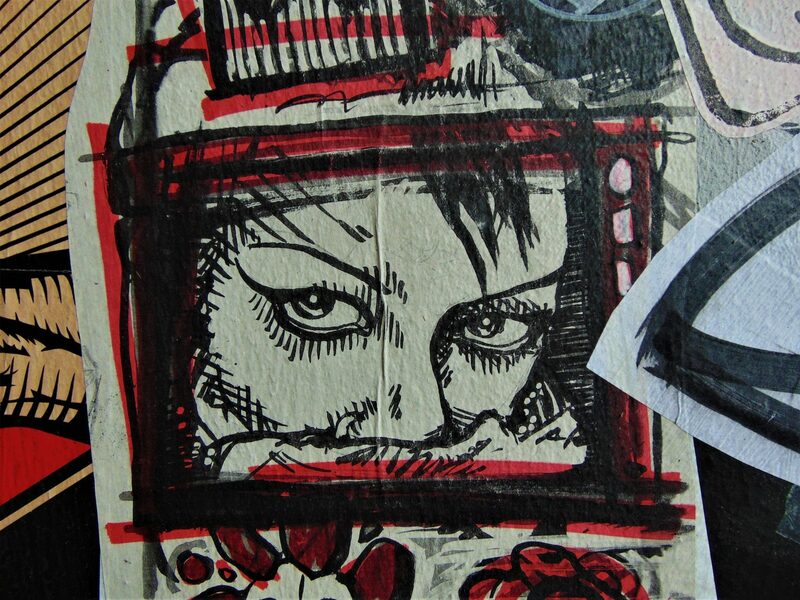 Street art, hidden art galleries, hip cafés, and lots of locals. 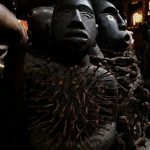 Nearby is a venue called Knust, and in that little complex you will also find a few alternative cafés and record stores which are worth checking out. 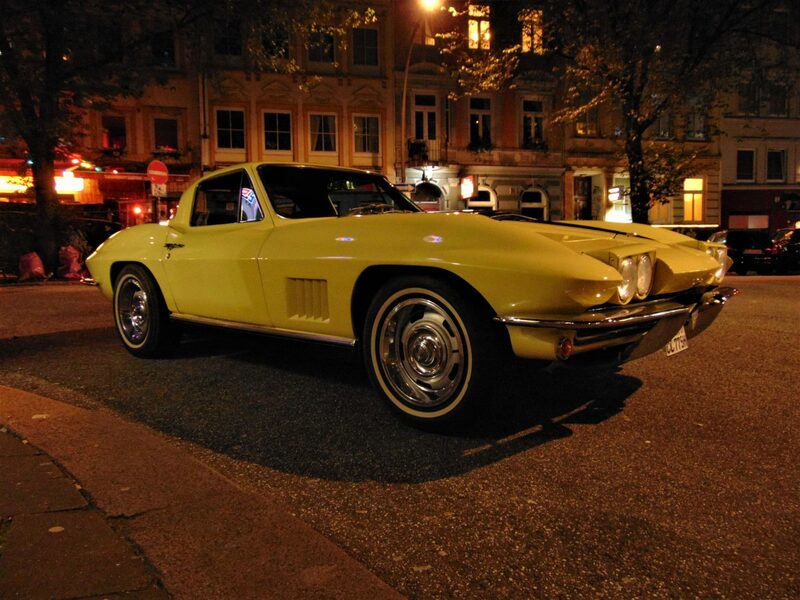 You can’t go wrong in the Karoviertel. Not far from the Grosse Freiheit is the Königsstrasse, effectively an extension of the Reeperbahn. 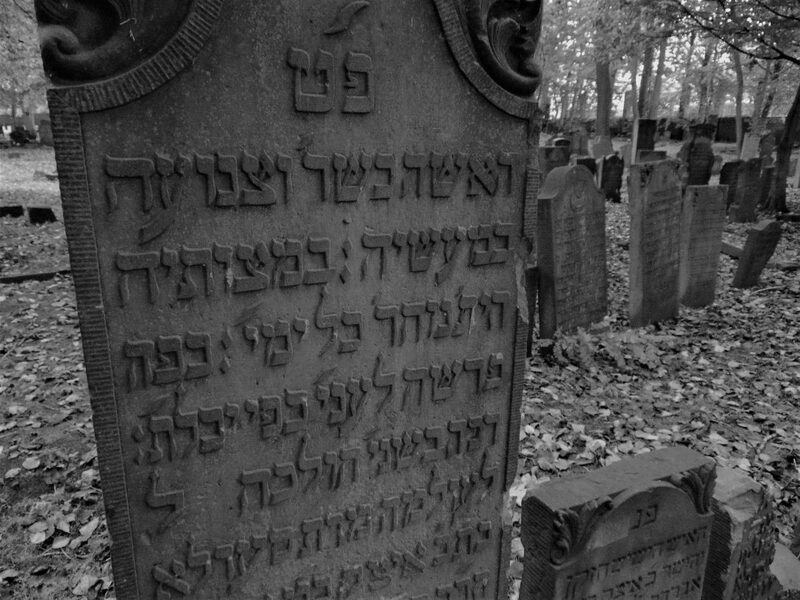 This street is home to one of the oldest (and very few) Jewish cemeteries in Northern Europe. 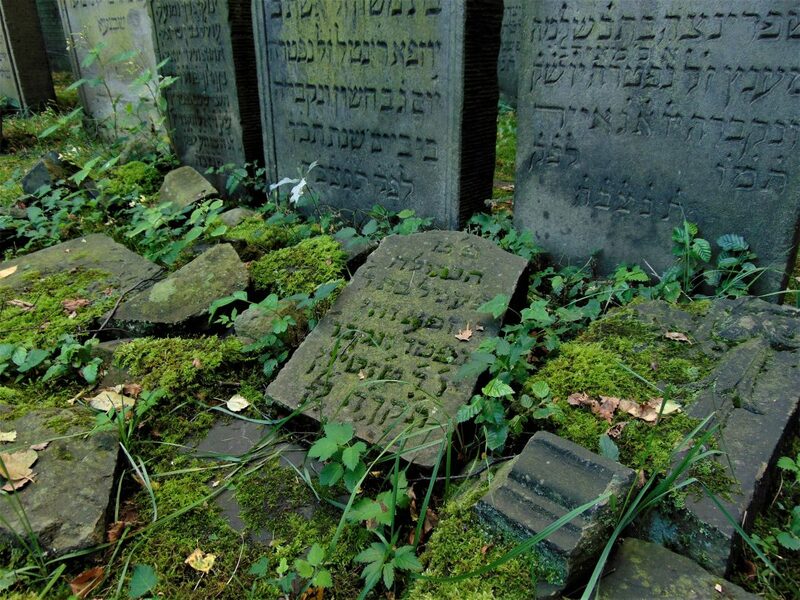 The Jewish cemetery in Altona was established in 1611 by members of the Portuguese and Spanish Sephardi community who had emigrated from the Iberian peninsula to the North of Germany. 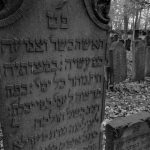 The cemetery was also used by the local Ashkenazi community, and was the choice final resting place of the Jewish community of Hamburg and Altona until is was put out of use in the 19th century. 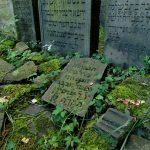 Luckily, the cemetery somehow managed to survive the National Socialist period and now stands as a testament to the rich history of the Jews in Europe. 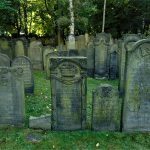 Be sure to take a look at the cemetery’s opening hours on its website, for it is only open three times a week. Click here for more pictures! The magnificence of this architecture will hit you like a ton of bricks! Sorry for the pun, but the presence of these buildings is overwhelming. 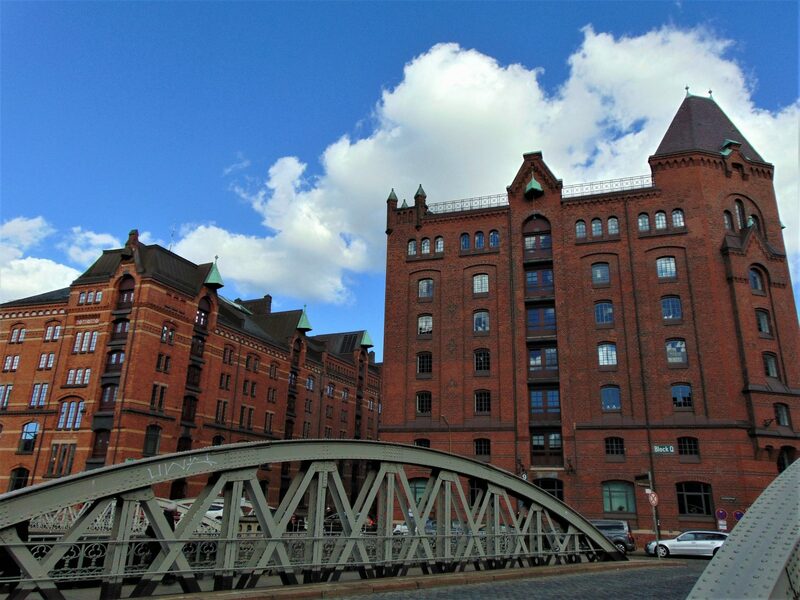 Hamburg’s Kontorhausviertel is home to some of the city’s most impressive buildings—all fine examples of brick expressionist architecture. 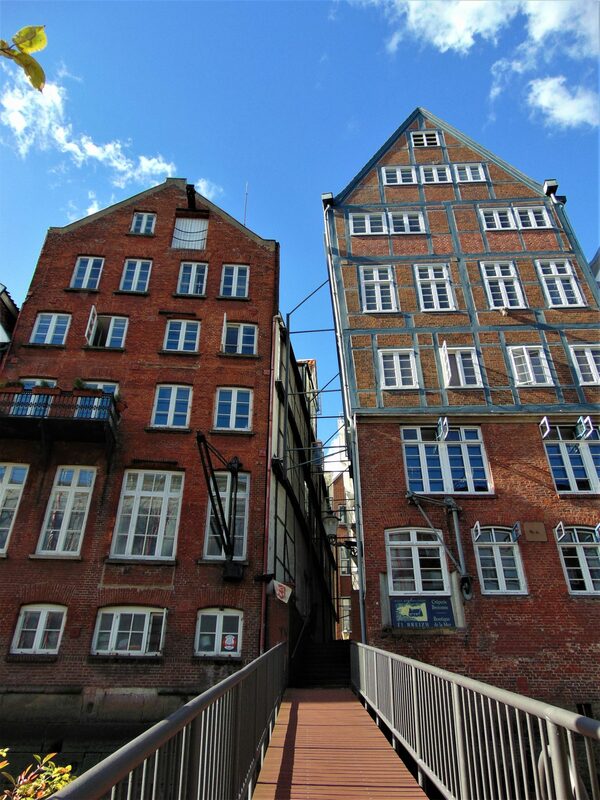 The type of building is called Kontor, which is an old word for Hanseatic trading outpost. The principal point of reference here is the Chilehaus: Completed in 1924, this massive, UNESCO-inscribed building is so full of detail it’s overwhelming. Some of the other edifices in this part of town, however, are no less intricate and impressive, as they were erected more as symbols of status than functional office buildings. Just down the street from the Kontorhausviertel is the Speicherstadt, meaning literally City of Warehouses. This warehouse district was completed in the early 20th century and, due to its size and aesthetics, is also inscribed as a UNESCO World Heritage Site. Here at the Speicherstadt, rows of red-brick warehouses stretch along little canals, leaving the visitor little doubt of the city’s importance as a world-trading center at the turn of the century. 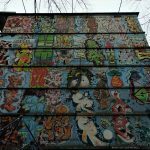 The Gängeviertel is one of the coolest places in Hamburg. 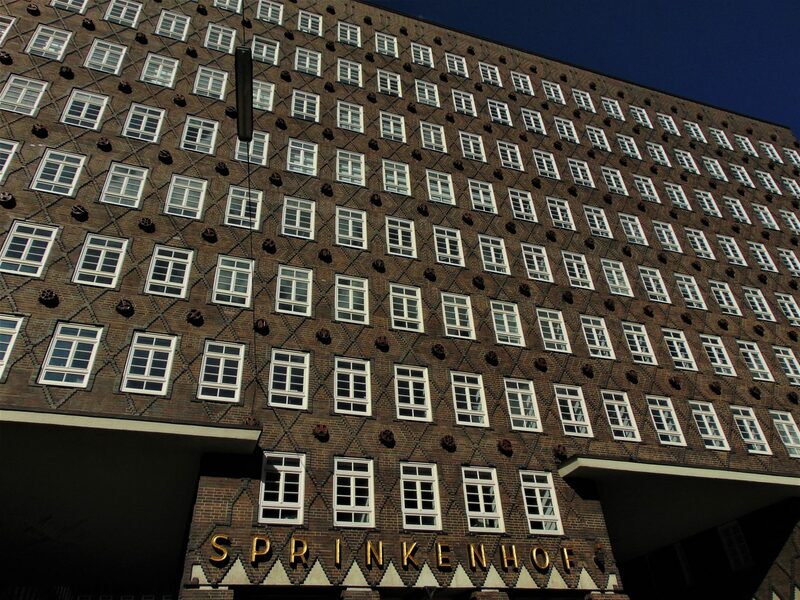 A short walk away from Jungfernstieg and the Alster, this complex of old working class buildings stands out first and foremost because of its location, as there are otherwise only modern office buildings all around it. 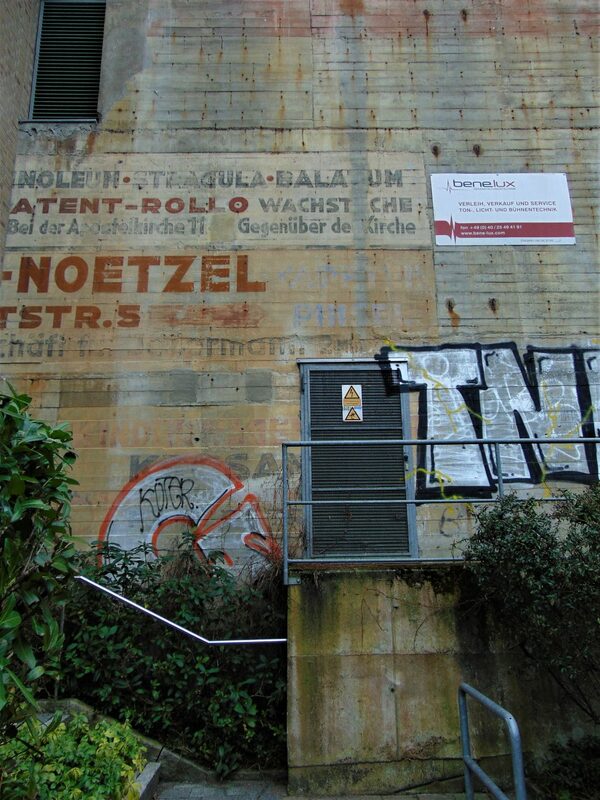 The buildings of the Gängeviertel somehow survived the bombs that destroyed a huge part of this area. 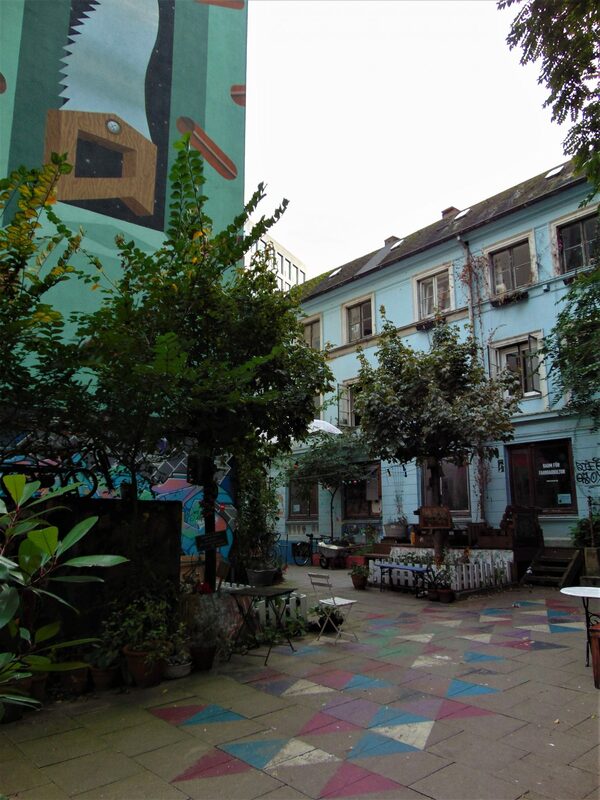 Small buildings with bare brick facades stand defiantly in the middle of a business quarter, and offer a friendly space for creatives, artists, social activists as well as a cafés, a bike repair workshop, and a donation-based venue called Druckerei (where I often attend Metal shows). To get there: Subway U2 (Red Line), station Gänsemarkt. 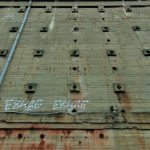 I mentioned Hamburg’s bunkers in the beginning of the article. Well, there is one that was actually turned into a museum in Hamburg-Hamm. 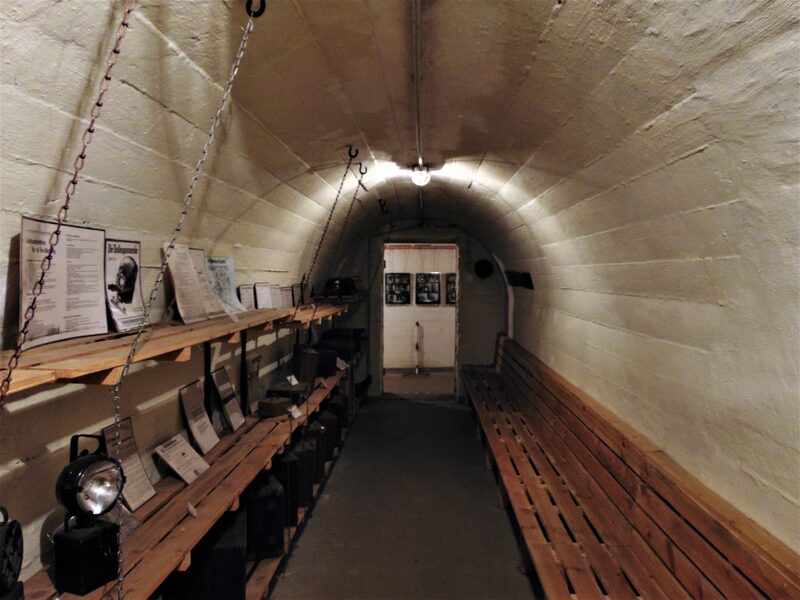 The small air-raid shelter was built between 1940 and 1941 and offered protection for 200 people—50 in each of its four chambers. 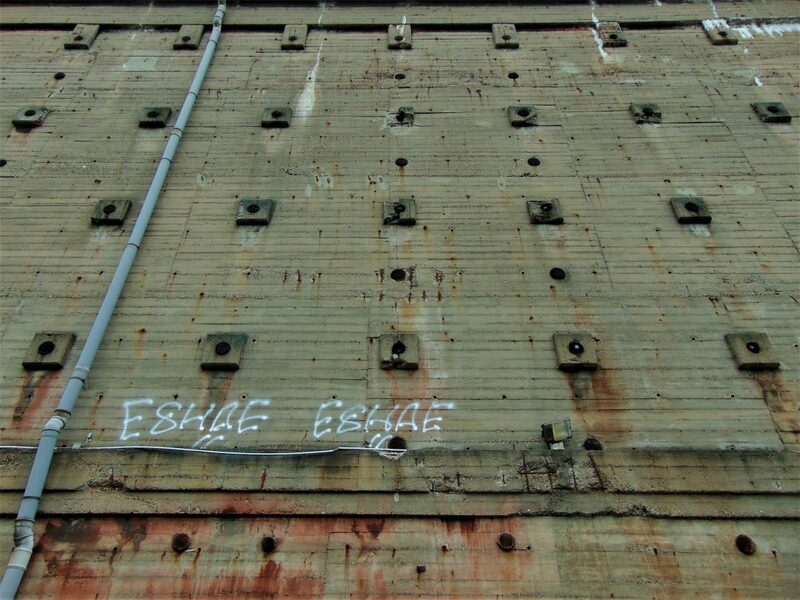 The bunker is five meters underground, and its concrete walls are one meter thick. The bunker is only open on Thursdays. Visit their website for their exact opening hours. 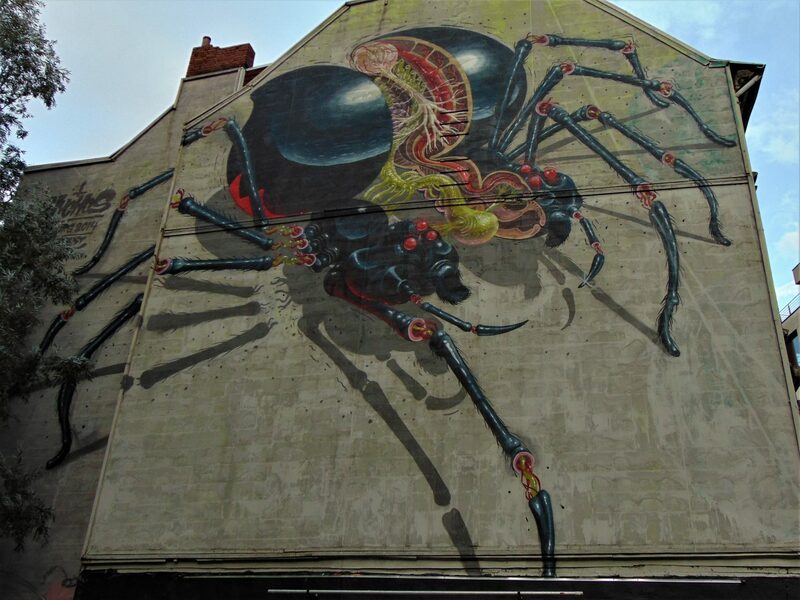 Hamburg is a city full of oddities, many of them brought from elsewhere. 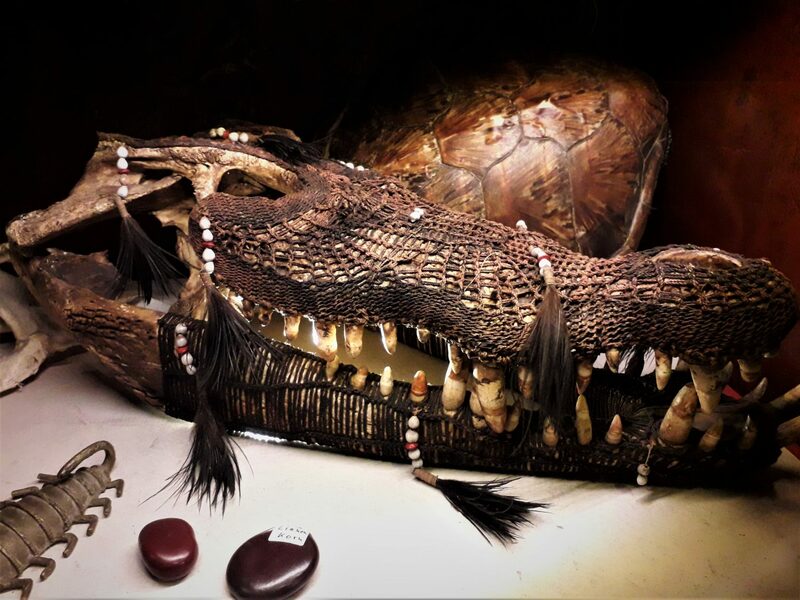 Being a port city, Hamburg welcomed sailors coming from and going to all corners of the world, and many of them brought back objects from distant lands that they collected during their trips. In 1894, a certain Captain Haase opened a bar in St. Pauli, which after a short time became a depository for strange artifacts from all over the world. 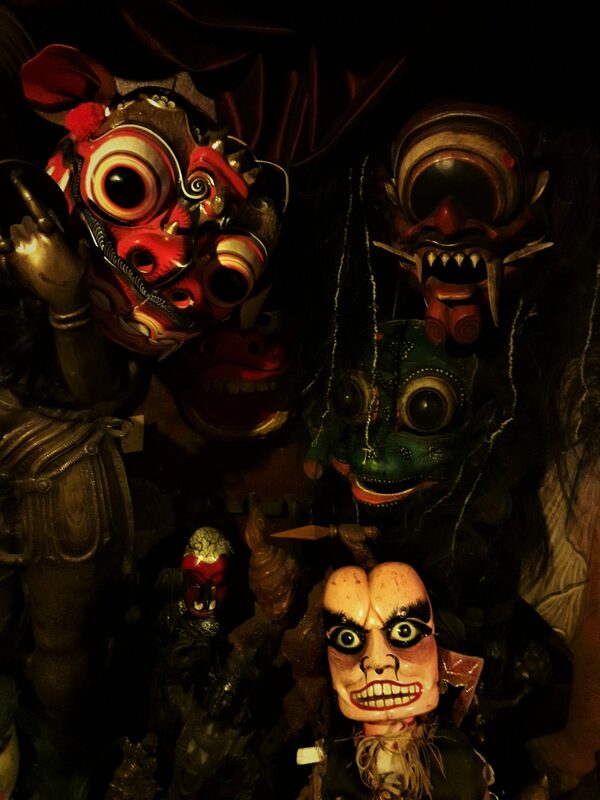 The collection grew, and after Captain Haase’s death, a former sailor named Harry Rosenberg took over his collection and opened “Harry’s Harbor Bazaar,” a museum dedicated to the odd, morbid and exotic. Nowadays, the bazaar is housed in a ship down on the HafenCity, not far from the Elbphilarmonie. 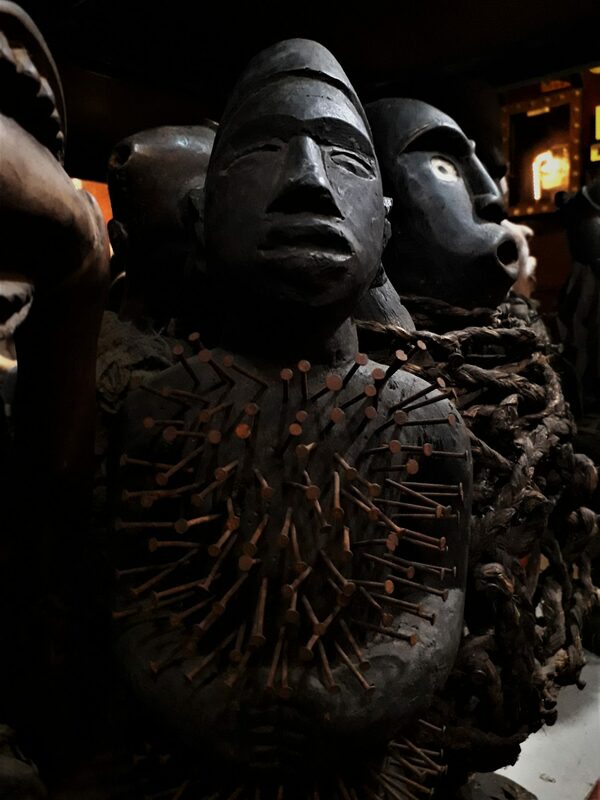 The macabre collection includes everything from African fetish statues to Japanese demon masks, and their collection even features two real shrunken heads. Check out their website for their opening hours! There you have it, folks! This should keep you entertained during your time in Hamburg. Should you have any questions or be after more tips feel free to hit me up. If you come through town and I’m around I might even be able to show you around a bit! I seriously can’t wait to get up there in January and explore more than just my usual passing through!!! So looking forward to your visit and doing some serious exploring with you! Good job, great blogpost again! Loved the mixture of history and alternative modernity you use to explore cities! Thanks a lot, Johanna! Glad you enjoyed the read. Very good. A good wealth of insider knowledge and historical understanding. And the collection of photos is “on point”, particularly the sunset pics. Quick question; was the Jewish migration from Spain to the area in response to the Spanish Inquisition and general religious intolerance of the time on the Iberian Peninsula? Thanks a lot, man! Glad you liked it! Quick answer: Yep, it was.